Update: I lost interest after the last update. When I heard the incredibly depressing song by Jewel, I turned off the TV. Hope I didn't miss anything good. Update: 7:33 pm: The first upset: Kyra Sedgwick (Closer) beats Julianna Margulies for Best Actress in a drama. Another good skit: the "Year in Variety" with musical acts, Colbert, and Conan. Jimmy's energy is holding. Update: 7:04 pm: Hooray! Aaron Paul, the nominee I was rooting for the most tonight, just won Best Supporting Actor in a Drama Series for Breaking Bad. He was incredible this season as was the show. And Bryan Cranston just won again for best lead actor for the show. I'm so glad to see this show get its due. Another great call: Archie Punjabe for Best Supporting Actress in a Drama for The Good Wife. This bodes well for Julianna Margulies. The Good Wife started weak, but ended up being a really strong show. 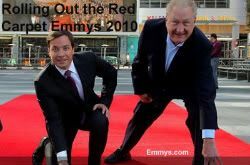 The 2010 Emmy Awards will be broadcast live without tape delay across the country tonight. The awards start at 8pm ET, 5pm PT. But the red carpet arrivals and backstage action begin earlier. On Twitter, the official hashtag is #emmys10.